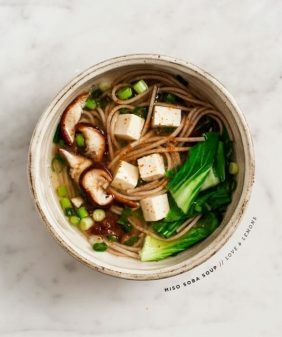 This nourishing ginger miso soup recipe is filled with shiitakes, turnips, tofu, carrots & soba noodles. A delicious healthy lunch. I’ve had this miso soup in the queue for a little while now. 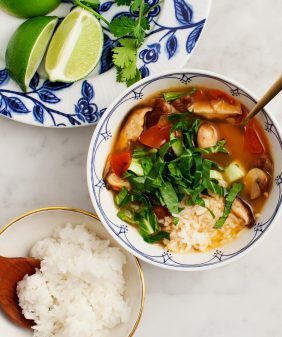 Which isn’t normally the way I work, but I knew this humble healthy soup would get little love in between all of the sparkly & sprinkle-y holiday recipe madness. So I saved it especially for this week, which is otherwise known as the soupiest, salad-iest week on the internet. Turnips are a little new for me. I can’t say that I ever didn’t like them, but I never really went out of my way to eat them. Lately, they’ve been catching my eye at the farmers market, and I haven’t been able to get enough. Pink, white, roasted… but I especially like them simmered down into soups like this one. Their bitterness subsides as they soften and soak up the broth. Oh, and not pictured here – are those beautiful turnip greens that I chopped up, set aside, and sadly left out of the photo above (oops). Add them (or any other greens you like) during the last 10 or so minutes of the simmering time – just long enough for them to wilt. And like most soups, this one gets better the longer it sits. (It was especially good around day 2 or 3, and it reheats perfectly). 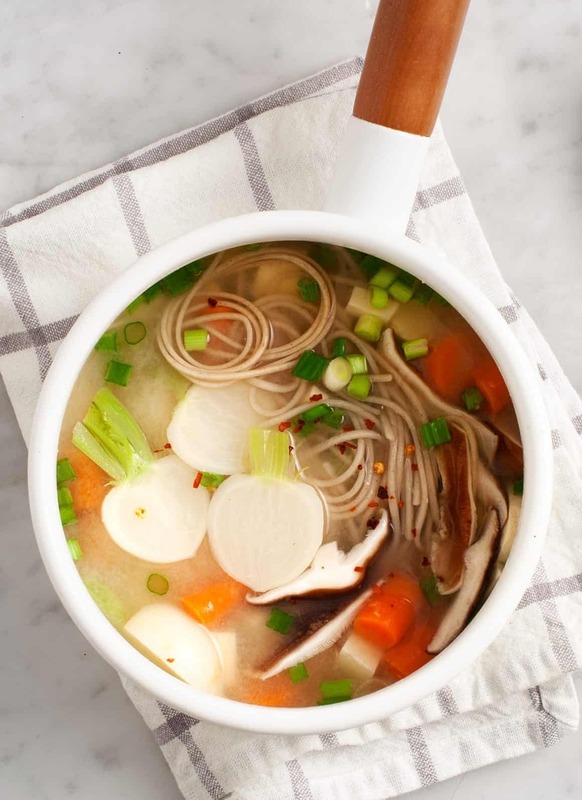 This nourishing ginger miso soup recipe is filled with shiitakes, turnips, tofu, carrots & soba noodles. A great healthy lunch. Make the dashi: Gently rinse the kombu piece. Place it in a medium pot with 4 cups water and gently simmer for 10 minutes. Don’t let it boil, or the kombu flavor will turn bitter. Once the kombu piece is soft, remove it and bring the water to a boil for just a few minutes. Reduce the heat again and add 1 cup more water. In a small bowl, stir the miso paste together with some of the hot dashi water (until it’s not clumpy), then stir to incorporate it into the soup broth. 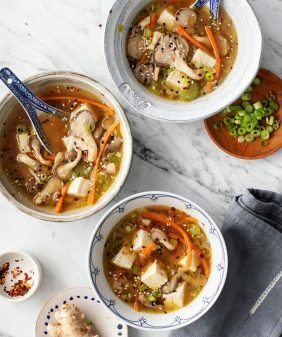 Add the ginger, scallions and shiitakes, turnips, and carrots and simmer on low until the turnips are soft and fork-tender (about 35-40 minutes). Note: If your soup is too thick, add 1-2 cups more water until it is a thinner consistency. Add the tofu and cooked soba noodles. Then taste and adjust seasonings, adding a few teaspoons of soy sauce if you like. Store leftover soup in the fridge for 3 to 4 days. 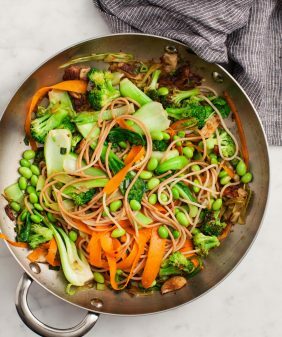 In this recipe I used King Soba brown rice noodles (which are gluten free). I also like Eden's soba noodles, although I find the 100% buckwheat noodles get a little too clumpy. 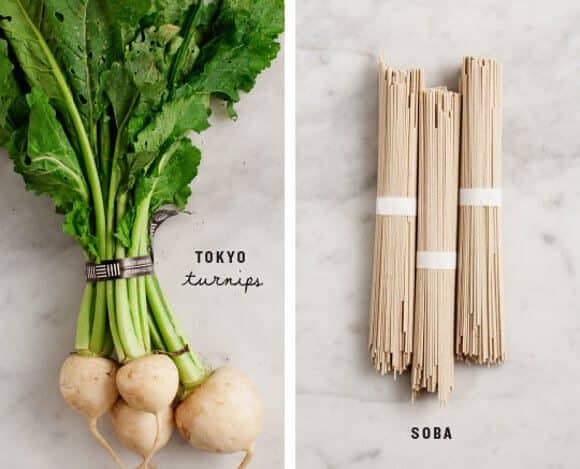 I have never tried a Tokyo Turnip! I can’t wait until our lovely WF opens in a few months. Turnip season will be close to over but I’ll look and hope anyway! Never tried Tokyo turnip either! But I love how the longer the soup sits, the better it gets. And how it re-heats up nice. Perfect to take for lunch and tastier than that PB&Jelly sandwich….by leaps and bounds!!! This looks wonderful Jeanine! 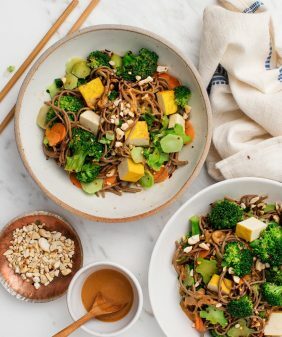 I love clean and healthy Japanese food and this is exactly what I want after the period of festive eating! I can’t believe I just realized this but I have not had turnips in years! Completely inspired to make this now! I don’t use turnips much either. This would be a good excuse to do so, especially because I’m always making a version of miso soup! 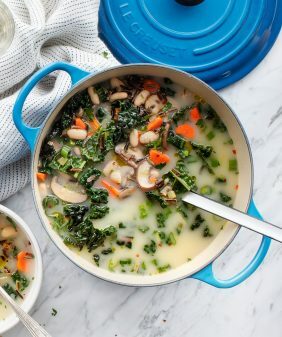 I’m making soups for like every meal these days…this one is so unique that I just HAVE to add it to the mix! Soup! This is exactly what I want to eat lately — filled with winter veg, hot, and comforting. Hooray! This sounds so delicious! I’ll definitely have to keep my eye open for Tokyo turnips. I’ve never actually cooked with turnips before!! Love the look of this soup. ooh, this looks perfect for the cold weather right now! I have been eating miso soup by the gallon lately. It is so simple, and easy to alter to use up whatever I have in my fridge that day. I love adding kale to my miso soup. The saltiness of the miso paste helps town down the bitterness of the kale. This soup is so pretty and I am sure tastes just as good as it looks. My boyfriend is obsessed with anything miso. Can’t wait to make this for him! Can you please tell me which fonts you are using? Especially the handwritten one, I love it so much! But I can’t find it anywhere..
Hi, do you know where can I find Tokyo turnips in Austin? Does Whole Foods in North Lamar carries them. Thanks for a beautiful recipe!